(Kitco News) – World markets are mostly subdued Tuesday as traders and investors worldwide await the results of the U.S. presidential election. The latest polls generally show Hillary Clinton with a slight lead. However, the U.K. Brexit vote results in June that defied the polls are still on the minds of many. The marketplace would take a surprise victory by Donald Trump as an injection of keen uncertainty and trading in many markets would likely become volatile. Global equity markets rallied Monday on the weekend news that the FBI had once again cleared Hillary Clinton of criminal conduct regarding her personal email server. The majority of the world marketplace is thinking Clinton will win the presidential election. 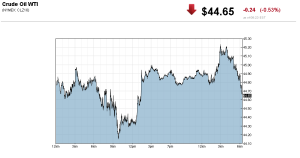 Safe-haven gold prices sold off sharply Monday, amid the keen "risk-on" trader and investor attitudes. The yellow metal is seeing a moderate corrective bounce Tuesday. In overnight news, the OPEC oil cartel said Tuesday that world oil prices will not rise by as much as the cartel forecast earlier. It said demand won't rise as much as OPEC expected. Nymex crude oil prices are presently trading near steady at just below $45.00 a barrel after dropping to a nearly three-month low of $43.57 last Friday. U.S. economic data due for release Tuesday includes the weekly Johnson Redbook and Goldman Sachs retail sales report. A couple of Federal Reserve officials also speak today. 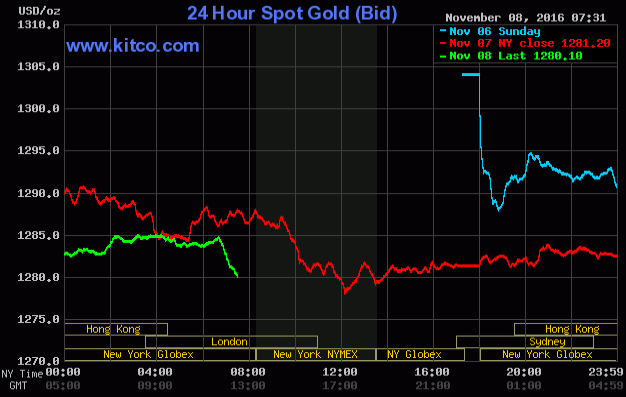 Strong selling pressure seen in the gold market Monday continued during the overnight Asian trading session. Spot gold on Kitco hit resistance of $1,286.10 an ounce with support coming in at $1,279.40 an ounce.